5 Things A Good Trade Show Booth Does | Displays and Exhibits, Inc.
A good trade show booth is so much more than just attractive signage and smart branding. From tending to audience needs and team needs to representing your brand in a tried and true light, booths need to be a balanced equation of multiple qualities to ensure success. The booth should create a consistent, cohesive message that stays true to the brand story. Without getting caught up in being eye-catching and overly creative, each style of signage developed for your brand and booth space should remain in the same vain as your business’s typical voice and image. aking unique risks can pay off if your brand is regularly avant garde, but to jump too far outside of your normal realm can leave those customers and clients already familiar with your brand reputation a little confused. The visually attractive and attention grabbing types of signage styles don’t have to be too extreme to still attract your current clientele, as well as passersby. Simple changes such as unexpected shapes, placement and design can be much more beneficial than wild messages and marketing ploys. 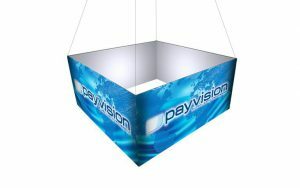 Simply choose display types that can attract all of the right target attendees from all angles. Whether that means incorporating large and small displays, overhead displays or outdoor displays, mixing up your lineup of tools helps to cover all aspects of the trade show publicity process. Trade shows are the perfect place for brands to release new products, unveil new services and otherwise make major announcements. Building up the booth to best outfit and represent these unveilings can be one of the smartest uses of your limited space. Showcasing the latest and greatest your business has to offer, a good trade show booth places these promotional products and services front and center for maximum attention. The booth space should be a home away from home for your team, and a direct representation of how your business appears and operates. Serving as a miniature version of your offices, showrooms or factories, a good booth provides the same uses for selling space, education and interactive experiences. The booth should have the same attention to detail as any other facets of your business and strive to best represent the brand from location to location. Aside from meeting the brand’s image and target audience’s needs, a booth should also meet and exceed the needs of the team. From state of the art tools to lightweight and convenient materials, great booths are designed to make things easier on all fronts. Technology and ease of setup should be taken into consideration to aid in supporting the brand team in their trade show endeavors.